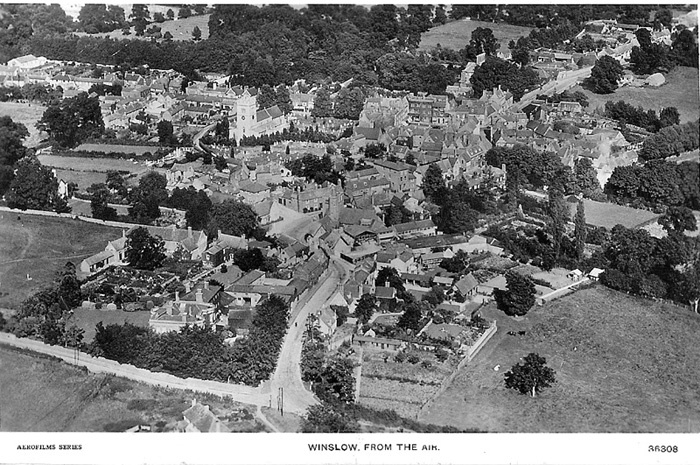 Winslow from the north-west (1931). Buckingham Road is in the foreground, before the development of the western side. The station and marshalling yard are in the top left. 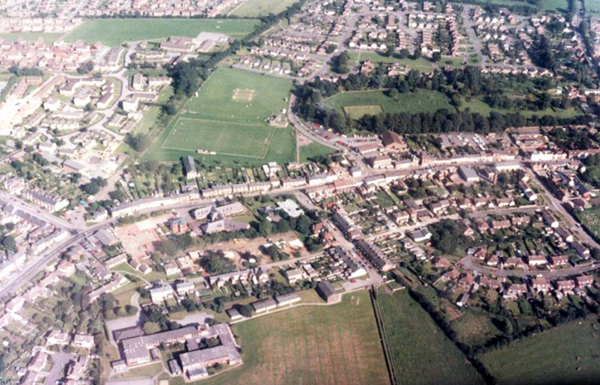 The fields and allotments in the top right are now the Magpie Farm and Lowndes Way estates. 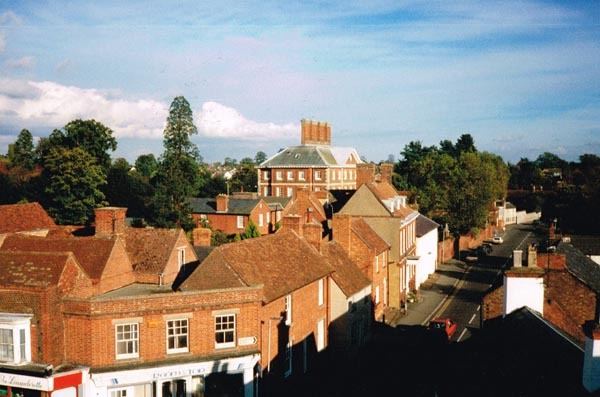 Winslow from the west. 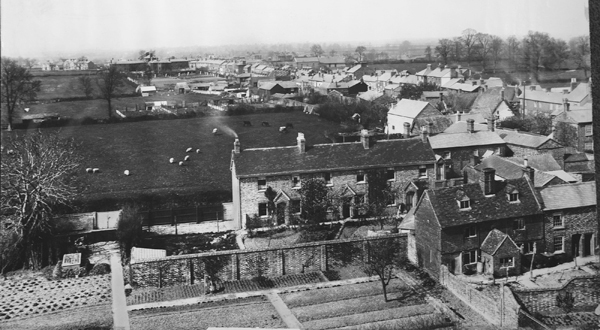 In the foreground are Burleys Road (before any houses were built) and Horn Street. The large house behind the trees is Western House (now demolished; Bevan Court is on the site). The High Street from the north. Avenue Road is in the foreground. The field mid-right became St Albans and St Laurence Roads. 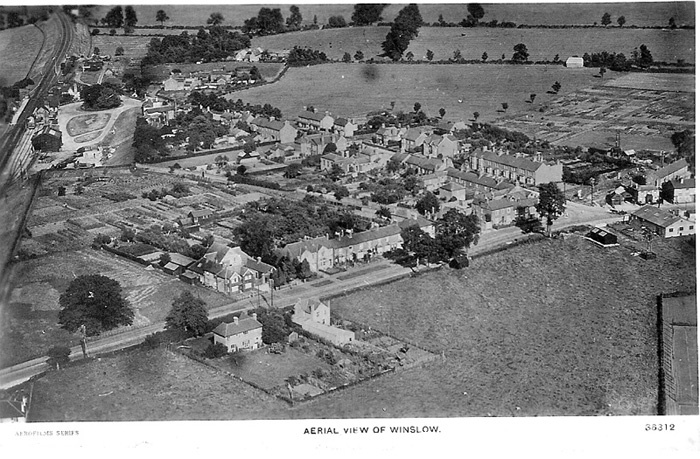 This photograph from the 1950s shows Winslow from the south, before the town expanded eastwards with the Lowndes Way and Elmfields estates. 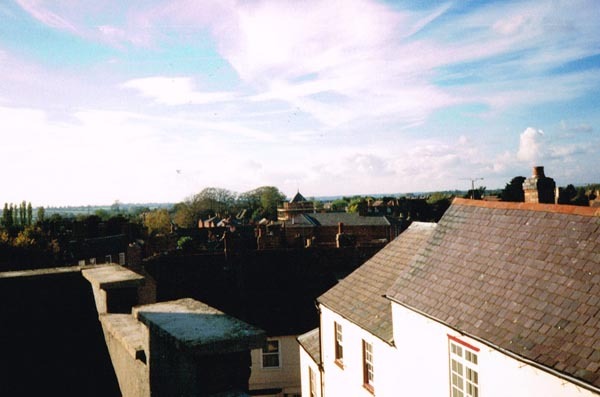 These five photographs were taken c.1990 from the roof of Midgleys' ironmongers (3 Market Square). 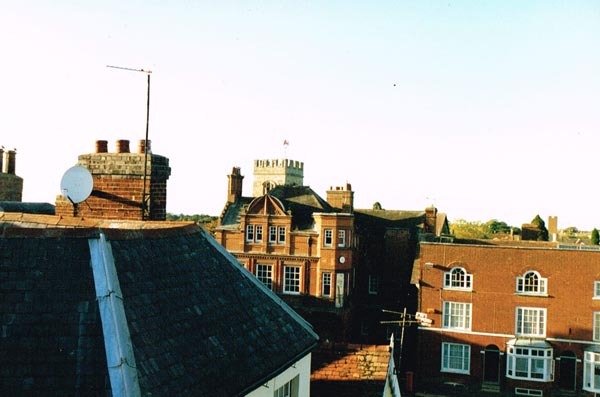 In the first, looking west, the George is in the foreground, and the tower of the Congregational Church in the centre. 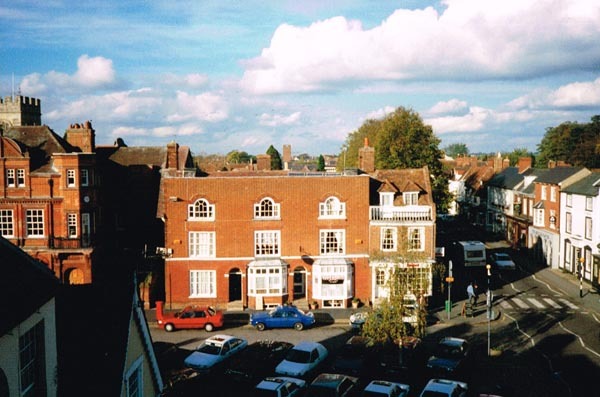 The second, looking north, shows the Market Square and part of the High Street. 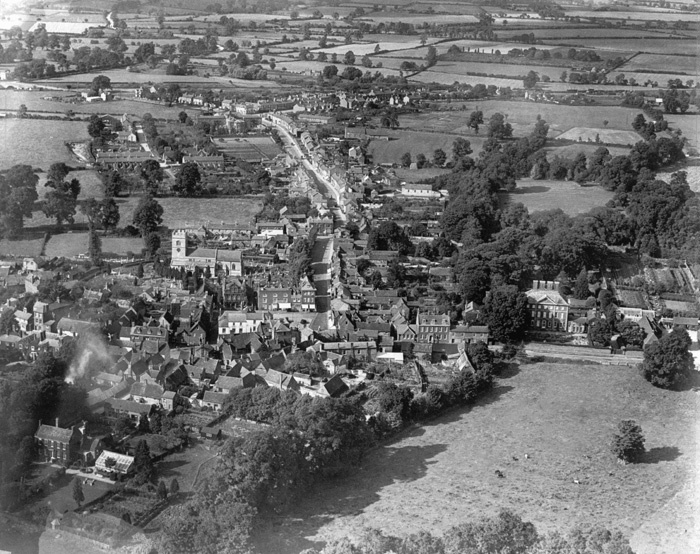 The third, looking east, shows Sheep Street, with Winslow Hall and Brook Hall in the centre of the photo. 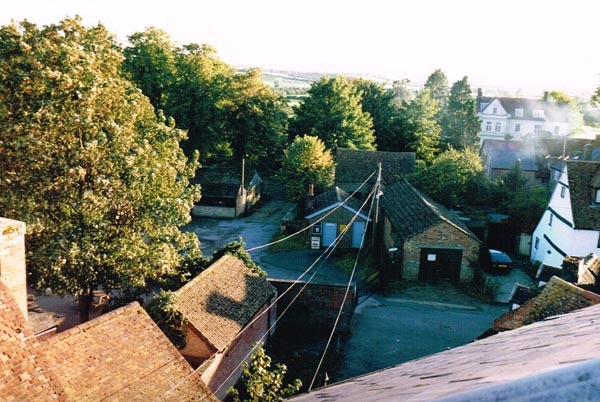 This one, looking south, shows the Cattle Market (left), Keach's Chapel (the furthest roof in the centre) and Lawn House (back right). This shows an unusual view of Lloyds Bank (formerly the Bucks & Oxon Union Bank, built 1891), with The George at the front. The photographer was looking northwards. 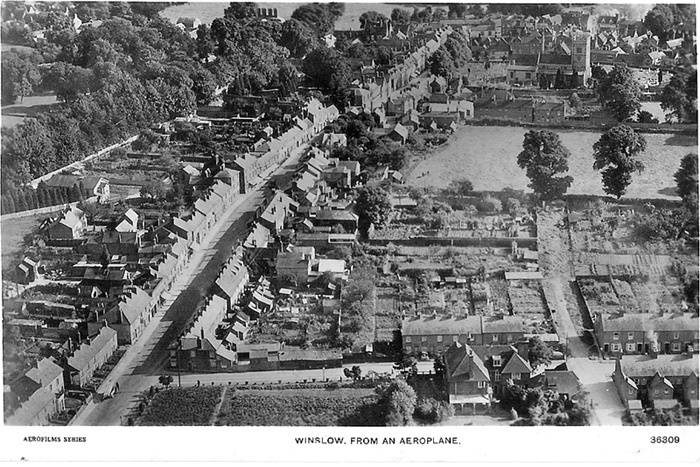 Vicarage Road (south side only) is in the foreground, then fields where St Albans Road and Avenue Road are now. 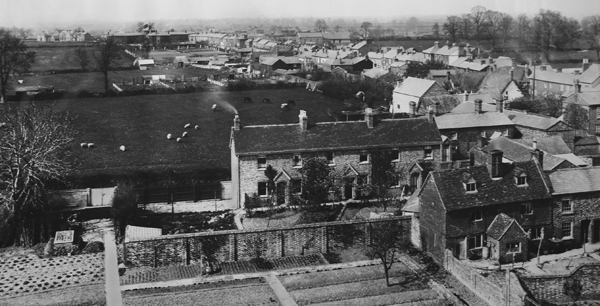 Further back you can see Buckingham Road (east side only), the Workhouse and grounds, both sides of the High Street, Station Road (north side only) and the Baptist Church. The field with trees in the top right corner is now the Recreation Ground. The original photo is printed on canvas. Click here for a larger version (1.91 MB).